We believe the Great epic Mahabharatha was written by the great sage Veda Vyasa. He was the grandfather of the Pandavas and the Kauravas. He had great powers of meditation and hence lived a very long life (One of the Immortals). He lived even after all his grandchildren – the Pandavas and the Kauravas had died. The above lines mean that by daily remembering these 8 immortals (Ashwatthama, King Bali, Veda Vyasa, Hanuman, Vibhishan, Kripacharya, Parashuram and Rishi Markandaya. There is real story behind Who wrote the Mahabharatha? Once when Veda Vyasa was meditating in the Himalayas, the God of creation – Lord Brahma appeared before him. Brahma asked Veda Vyasa to write the story of Mahabharatha. Brahma told Veda Vyasa that as he had seen the entire story and knew all the characters intimately, he was the best person to write the story. However Veda Vyasa was perturbed when he heard this. He knew that the Mahabharatha was a very complex story. He could not compose and write such a huge story at the same time. He needed somebody's help to write the story. Brahma told Veda Vyasa to ask Lord Ganesha – the elephant headed God, for help. He knew that Vyasa was capable of composing the epic at a very fast pace. In order to test Vyasa, he imposed a very novel condition. Veda Vyasa knew that Lord Ganesha being the God of Knowledge would take down the narration very fast. He smiled and asked a favour of Lord Ganesha. He said that Lord Ganesha was not to write anything unless he understood the meaning of what was narrated to him. Lord Ganesha smiled and accepted the condition. 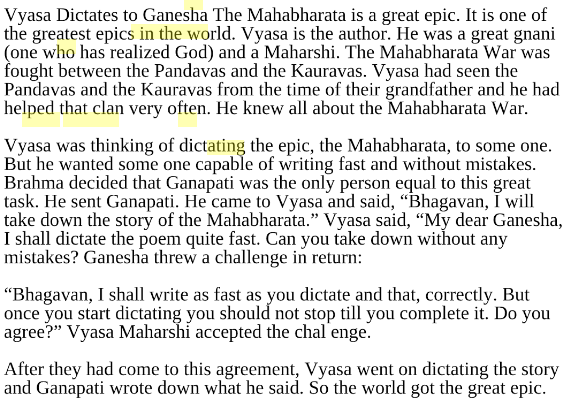 Thus Veda Vyasa began narrating the story and Lord Ganesha wrote down the story accurately. Whenever the sage needed some rest, he would compose a stanza (a verse) with a very difficult meaning. Lord Ganesha would ponder over the meaning of the stanza, while the sage refreshed himself, or composed more stanzas. The 'pen' with which Lord Ganesha started writing the story was not able to keep up with the pace of the two of them. Lord Ganesha was writing the story so fast that the pen broke! However Lord Ganesha did not stop writing, he just broke one of his tusks and started writing with it. That is the reason Lord Ganesha is seen in most of the pictures with only one tusk and the broken tusk in his hand. Thus, though the Mahabharatha was the longest story ever written, it was written in a total of three years! And Satyavati gratified with having obtained the excellent boon in consequence of which she became sweet-scented and her virginity remained unsullied conceived through Parasara's embraces. And she brought forth the very day, on an island in the Yamuna, the child begot upon her by Parasara and gifted with great energy. And the child, with the permission of his mother, set his mind on asceticism. And he went away saying, 'As soon as thou rememberest me when occasion comes, I shall appear unto thee.' And it was thus that Vyasa was born of Satyavati through Parasara. And because he was born in an island, he was called Dwaipayana (Dwaipa or islandborn). And the learned Dwaipayana, beholding that virtue is destined to become lame by one leg each yuga (she having four legs in all) and that the period of life and the strength of men followed the yugas, and moved by the desire of obtaining the favour of Brahman and the Brahmanas, arranged the Vedas. And for this he came to be called Vyasa (the arranger or compiler). Satyavati later went on to become the wife of the king Shantanu, who was the father of Bhishma, Vichitravirya and Chitrangada. When Vichitrayirya and Chitrangada died, Vyasa fathered children with Vichitravirya's wives Ambika and Ambalika, through the practice of Niyoga, as described in this chapter of the Adi Parva of the Mahabharata. These children were Pandu and Dhritarashtra. Pandu was the adopted father of the Pandavas, and Dhritarashtra was the adopted father of the Kauravas. So Vyasa's Mahabharata is essentially an epic poem about Vyasa's own grandchildren. Formerly, the spirited and virtuous Krishna-Dwaipayana, by the injunctions of Bhishma, the wise son of Ganga and of his own mother, became the father of three boys who were like the three fires by the two wives of Vichitra-virya; and having thus raised up Dhritarashtra, Pandu and Vidura, he returned to his recluse abode to prosecute his religious exercise. It was not till after these were born, grown up, and departed on the supreme journey, that the great Rishi Vyasa published the Bharata in this region of mankind; when being solicited by Janamejaya and thousands of Brahmanas, he instructed his disciple Vaisampayana, who was seated near him; and he, sitting together with the Sadasyas, recited the Bharata, during the intervals of the ceremonies of the sacrifice, being repeatedly urged to proceed. And there are even stories of Adi Shankaracharya and Madhvacharya meeting Vyasa! The son of Satyavati having, by penance and meditation, analysed the eternal Veda, afterwards composed this holy history, when that learned Brahmarshi of strict vows, the noble Dwaipayana Vyasa, offspring of Parasara, had finished this greatest of narrations, he began to consider how he might teach it to his disciples. In that respect Vyasa is similar to Valmiki, who lived through the events of the Ramayana but composed the Ramayana through divine vision as I discuss here. Not the answer you're looking for? Browse other questions tagged mythology mahabharata vyasa .